4) Was the spread of vegetarianism in India ultimately about carrying capacity and the caloric wastefulness of meat production? 8) And not unrelated, on education and equity: "When Finland's students scored so high on the first PISA survey in 2001, many Finns thought the results must be a mistake"
This paper has been in the works for some time now. Its innovative and important, with very pretty graphs! The chemistry of the human body makes our health and comfort sensitive to climate.Every day, climate influences human activity, including diet, chores, recreation,and conversation. Geographically, climate impacts the desirability of differentlocations and the quality of life they offer; few seek to live in the freezing tundraor oppressively hot deserts. 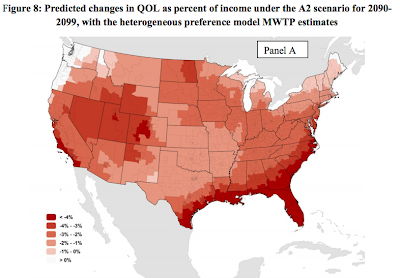 This paper estimates the dollar value American householdsplace on climate amenities, including sunshine, precipitation, humidity, and especiallytemperature. Valuing climate amenities not only helps us to understand how climateaffects welfare and where people live, but also helps to inform policy responses to climate changes. 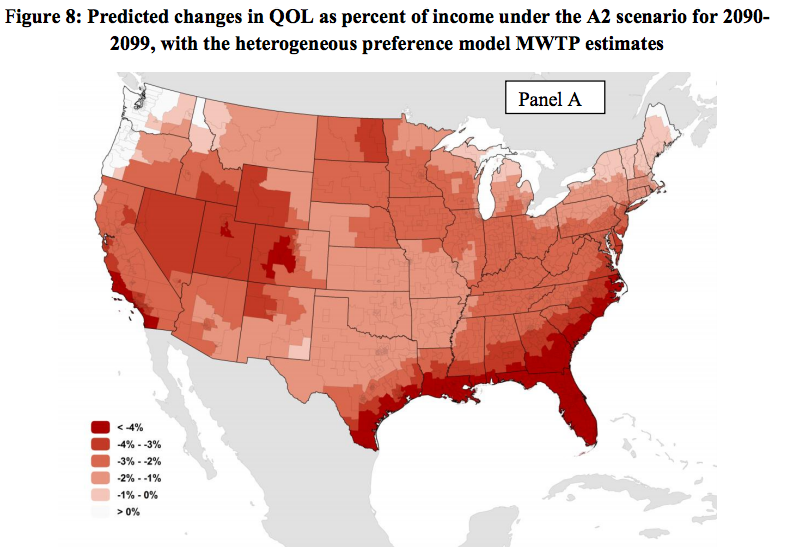 Using a quality of life measure that is carefully constructed from local wage andhousing price differentials, the authors find that Americans favor an average dailytemperature of 65 degrees, tend to dislike marginal increases in heat more thanmarginal increases in cold, and care less about marginal changes in outdoor temperatureonce the temperature is sufficiently uncomfortable that they are unlikely to gooutside. These preferences vary by location, reflecting people's preferences for warmer or colder climates. Changes in climate amenities under business-as-usual climate change predictions imply annual welfare losses of 1 to 3 percent of incomeby 2100, holding technology and preferences constant. 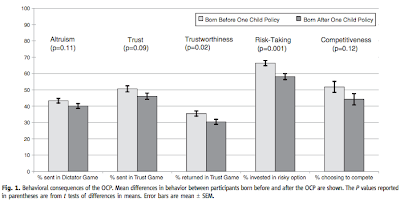 We document that China’s One-Child Policy (OCP), one of the most radical approaches to limiting population growth, has produced significantly less trusting, less trustworthy, more risk-averse, less competitive, more pessimistic, and less conscientious individuals. Our data were collected from economics experiments conducted with 421 individuals born just before and just after the OCP’s introduction in 1979. Surveys to elicit personality traits were also used. 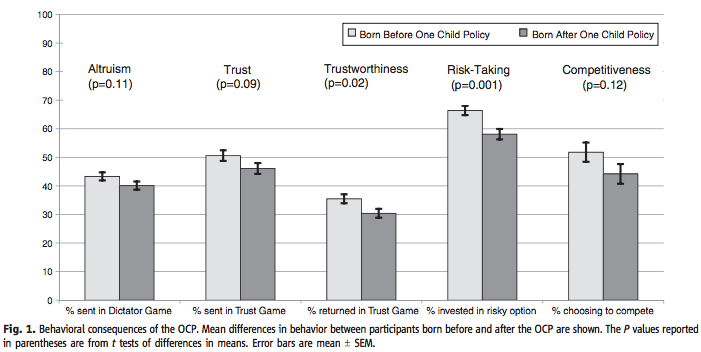 We used the exogenous imposition of the OCP to identify the causal impact of being an only child, net of family background effects. The OCP thus has significant ramifications for Chinese society. Maybe my favorite aspect of the study is not the content but the design: analyzing cohort effects using [a battery of] lab experiments. How stark is the reversal in global temperature trend? 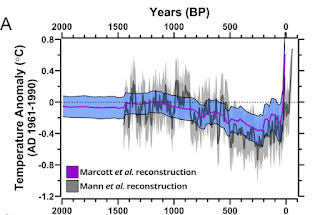 Last week I put a link to the recent Marcott et al. 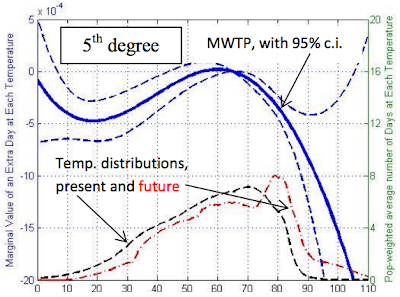 Science paper reconstructing Holocene temperatures in the weekend links. I've since taught it to both my graduate econometrics class (as a motivating example for statistical inference) and to an undergraduate research methods class (as part of a larger lecture on environment and development economics), and after mulling it over for a while think that the core message of the paper is actually fairly subtle. 6) Is it too soon to talk about velociraptors? I'll be presenting the condensed version of Sol and my Filipino typhoons paper, in the disasters session at end of day, and chairing the Politics and Outcomes session immediately before. Drop by and say hi if you're around.